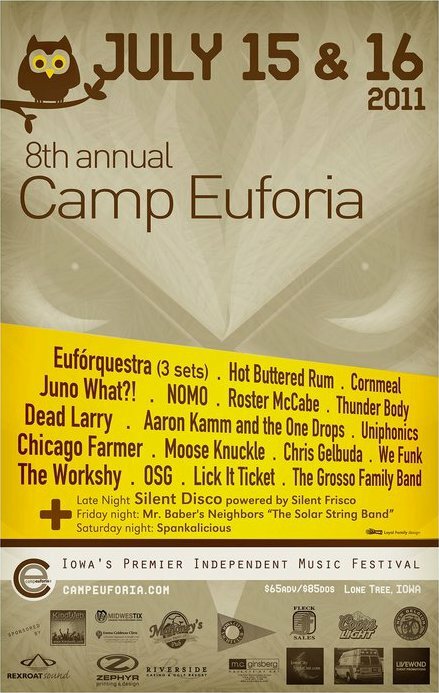 Camp Euforia started in 2004 as Eufórquestra's "Fan Appreciation Party." 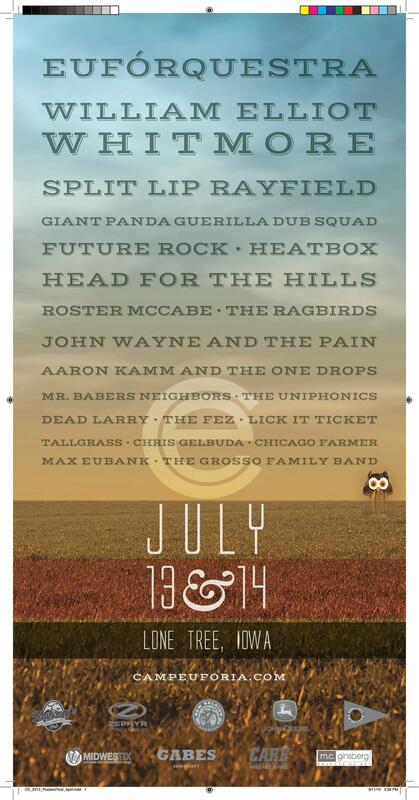 Since then, it has grown in to a full-blown music festival featuring 20+ artists over three days on two stages. 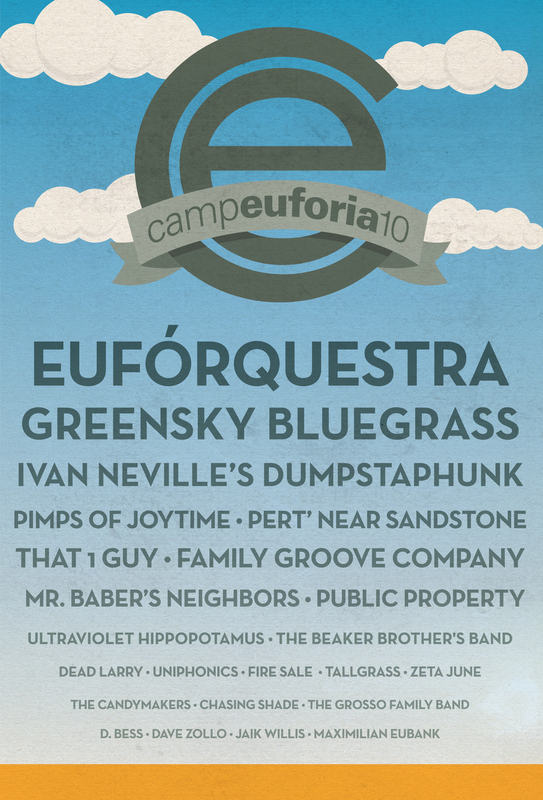 Eufórquestra's goal in creating Camp Euforia has always been a seamless gelling of Community and Music. 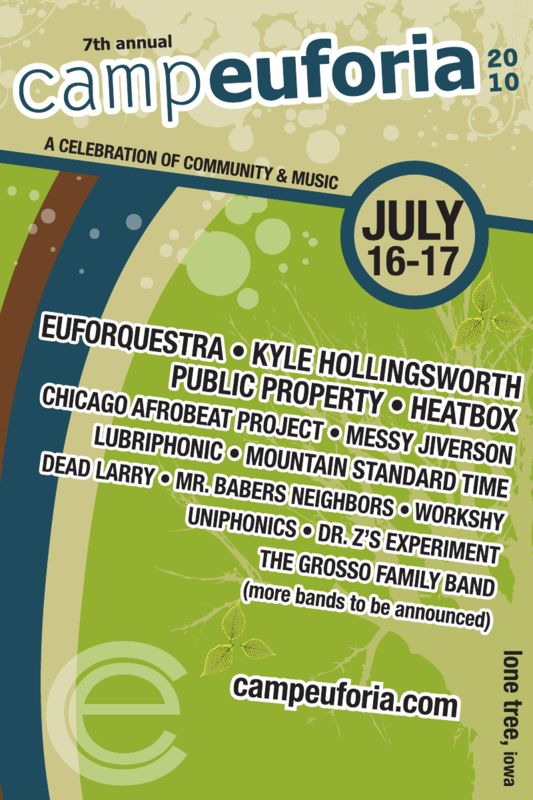 The festival focuses on the Iowa City music scene, but each year a handful of performers from across the country and Eufórquestra's touring friends are invited in to come and experience the magic! 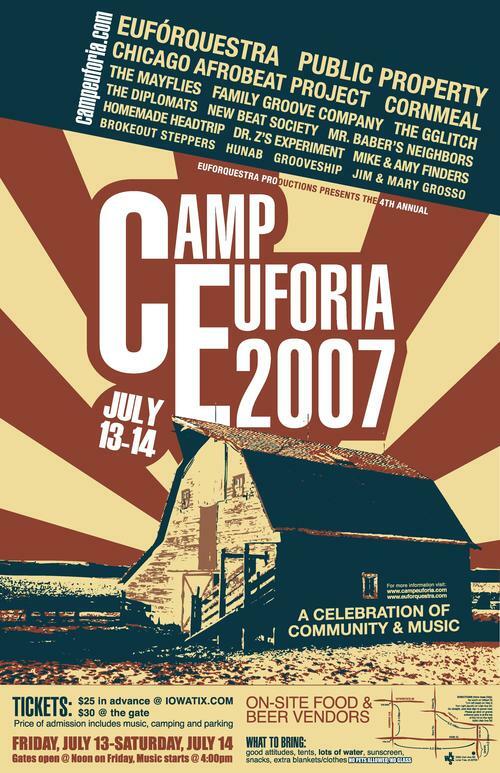 In 2004 Eufórquestra was based in Iowa City and decided to host their own music festival.They established a connection with a local farmer Jerry Hotz and asked him to partner with them by hosting Camp on his farm. Jerry was just as excited about the idea as the band was. The festival has been held on Jerry's property since its inception and as a result Eufórquestra and Jerry have become great friends as well as partners. As Eufórquestra's music has evolved so has Jerry's farm. Consisted of two hayracks and homemade banners made by Mike Tallman. Festival goers still have a special place in their hearts with the old red barn as the backdrop. It was torn down and salvaged in 2008 due to it's condition. Eufórquestra Big Band feat: Kim Dawson (vocals), Jennifer Hartswick (vocals), Matt Grundstad (percussion), and Robert Espe (Saxophone). In 2006 Jerry underwent a complete restoration what is know today as the "Barn Stage". A fresh coat of paint on the outside, a new roof, and cement over a dirt floor were just the beginning. New windows, updated electric, a built in stage and sound booth have created a special place for festival goers year over year. In 2008 Jerry added his own bar. "Jerry's Bar" was made from reclaimed barn lumber. The bar now sits in his open air shed (built in 2013). It has become a marquee location for festival goers throughout the weekend. Festies gather at Jerry's Bar for the best brews & cocktails! Jerry's Bar 2012. One year prior to the construction of the open air shed that hosts the bar today. The bar skirt and the portions of the walls were created from reused barn lumber. Jerry assembles a crew to weed his award winning flower beds every year just before the festival. Jerry's grounds are full of outdoor artwork and accent lighting. Almost every aspect of his 5 acre homestead boasts a different expression of Jerry's passion for landscaping. Farm Hands 2011 - From mowing to fencing and everything in between this crew puts in hundreds of hours to prep for Camp each and every year. The welcome Banner has become an Iconic symbol of the start of the festival over the years. Each year this three frame shot has been followed on social media and has been a photo opp for many attendees during Camp. Camp Euforia is proud to allow RV Parking for your ultimate camping experience! Spots for RV Parking are limited, so once again this year we'll be encouraging you to reserve your spot in advance. You'll need to select an RV Parking Pass in addition to your GA Ticket passes. Additional persons traveling & camping with your RV will still need to purchase GA tickets to enter the festival grounds as well. RV Parking Pass is $70 in advance. If you choose not to reserve a spot in advance for your RV or camper, you will be charged $100 to park day of show, and subject to availability and space. Reserve Your RV Spot Today! 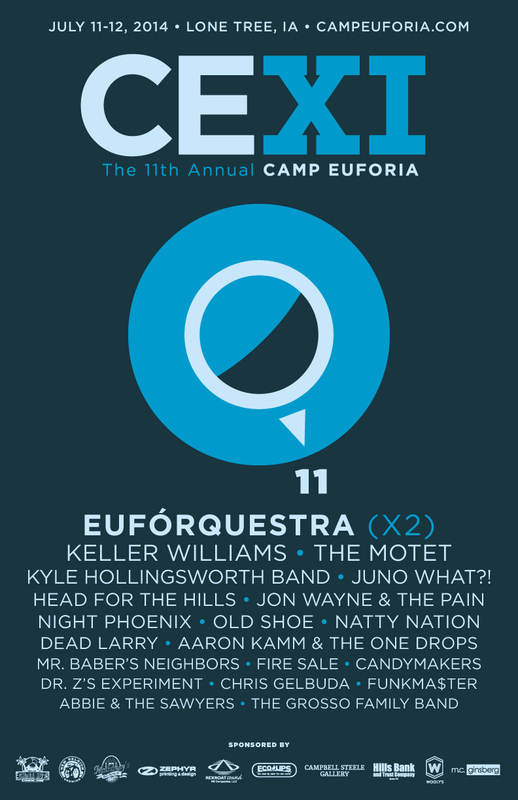 Camp Euforia is a source of music and community for hundreds of people each year. It’s no small feat to put on an event of this size – it takes the hearts and minds of a great many volunteers and coordinators working together to pull it off year after year. By dedicating your time as a volunteer, you’re helping make an exciting experience for everyone. We appreciate your willingness to be here and thank you for being a part of Camp Euforia 2019! Volunteer positions for 2019 are now live! Supreme joy for helping make this event possible! This year you will need to select (2) 4-hour shifts in addition to the Sunday requirement in order to receive a full ticket refund. There will be camping Thursday night, so there is still a Thursday option if you want to get one knocked out then! As usual, there is a mandatory clean-up shift on Sunday morning that will take place from 10am-12pm, for all volunteers. This shift is possibly the most important to keeping the festival going each year and a must for all volunteers that are expecting a reimbursement of their ticket cost*. *Ticket cost only will be refunded, we cannot refund the processing fees. Your ticket confirmation number is emailed to you following ticket purchase, please insert that in the related signup field. Please note: we cannot refund tickets that are not purchased through the ticketing system. *Shower ticket provided after your first completed volunteer shift. Must provide own towel & soap. Limited time frame to redeem each day. Contact volunteer@campeuforia.com for more information. Getting to Camp Euforia is easy! It’s just southeast of Iowa City, and easily accessible from Interstate 80 or 380. Note: CE attendees in the past have complained that google maps has sent them to the farm from the south. Please take that into consideration when navigating to the fest. It will be easier to get in by coming from the north.